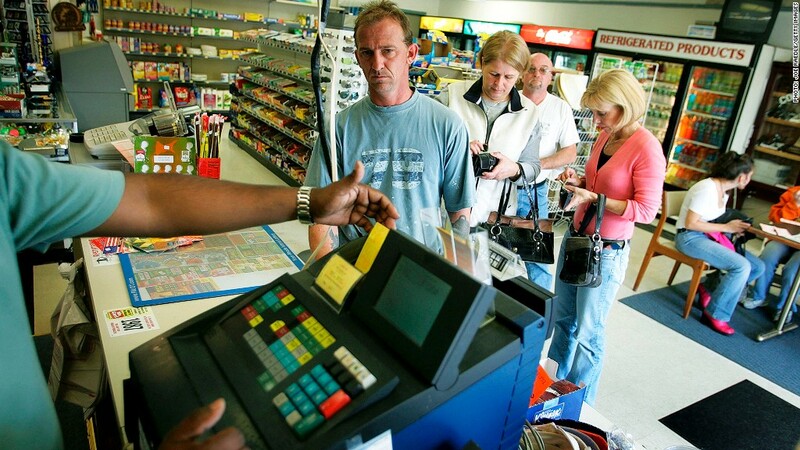 Do Powerball lottery sales really boost the economy? Does Powerball really boost the economy? Lottery players in Tiverton, R.I. line up to buy Powerball tickets. Millions of Americans are buying tickets for Wednesday's $500 million Powerball lottery, and you'd think that would mean a big economic boost for the 43 states participating. That's not a sure bet. Americans spent $65.5 billion on lottery tickets in the last fiscal year, up almost 10% from the year before. And lottery ticket sales have increased every year since the first state lottery in 1965 -- even during the Great Recession, when the sale of most other items declined. About 25% of the money taken in by lotteries goes to state governments, funding everything from schools to construction and even programs to help problem gamblers. That's a big infusion for state coffers. But some experts wonder if state economies would get more of a boost if consumers bought goods and services instead of lottery tickets. The research makes it pretty clear that the answer to that question is a resounding "yes," according to Victor Matheson, economics professor at College of the Holy Cross. "People spend disposable income on lottery tickets rather than buying a coffee at Starbucks or some gizmo at Best Buy," he said. Matheson argues that spending money with businesses helps spur much more economic activity than gambling on the lottery. While a quarter of Powerball revenue goes to the 43 states plus Washington D.C. that participate in it, about 60% of the money spent on tickets is paid out in the form of winnings. The retailers who sell the tickets get about 5% to 6% of ticket sales as commission, meaning they get only $10 to $12 for every 100 Powerball chances they sell. The remaining 9% or so goes toward administrative costs and advertising spending. Lottery tickets have become a significant source of funds for states, with just over $16 billion flowing through to state coffers in the most recent year. That's about 2% to 3% of their total budgets, said Matheson, which doesn't sound like much. But he said that given the difficulty states have raising tax revenue in the current economic and political environment, those funds would be difficult to replace. "[There's] an aversion to raising taxes," said Matheson. "It's difficult to see how you would eliminate that much of state budgets and be able to come up with money elsewhere." A big jackpot like this week's Powerball jackpot can be a mixed blessing for retailers selling tickets said Jeff Lenard, spokesman for National Association of Convenience Stores. While the retailers appreciate the extra traffic the lottery brings in, it can also chase away their regular customers who might have otherwise have been spending money on products with better profit margins. "Convenience stores sell convenience," he said. "You don't want to chase away someone from buying a cup of coffee." Still, Lenard said many shop owners are happy for the chance to reach new customers. He said the busiest days on record for convenience stores were back in March of this year, when the competing Mega Millions lottery had a record $656 million jackpot.